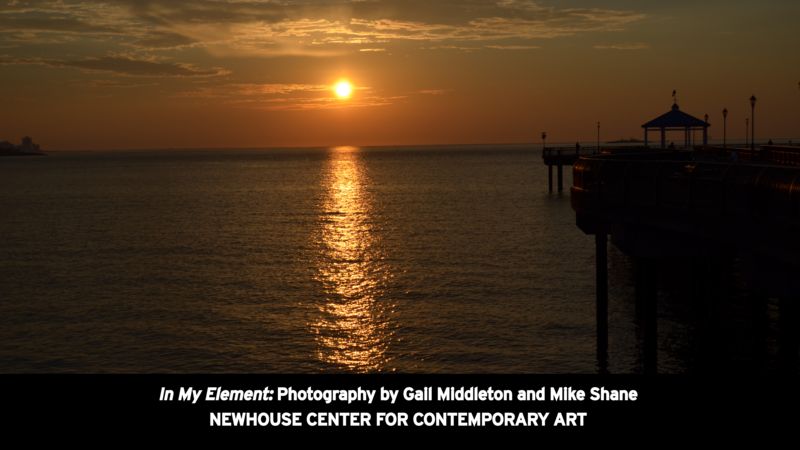 Join exhibiting artists Gail Middleton and Mike Shane on a guided tour and open discussion on their exhibition In My Element. In My Element is a combined show of two photographers who are separated in age by several decades but who both gravitate to capturing photos of four basic elements of earth, air, fire, and water. Gail Middleton can always be found in solitary locations, appreciating the happenstance of nature and trying to capture a moment in time to reflect the passing beauty. Mike Shane is a kinetic searcher whose interaction with people and elements are breathtaking. Their combined images will make you think, transport you to a place of beauty and wonderment, or just capture you with an almost impossible combination of perceived movement. All exhibits and programs are located in the Newhouse Center for Contemporary Art (Buildings C & G). Admission is $5 ($4 students/seniors). Free for students grades 6-12 with student ID. Spring – Autumn hours are Thurs-Fri 12:00 – 7:00 PM and Sat – Sun 11:00 AM – 5:00 PM. In My Element is made possible by the New York State Council on the Arts with the support of Governor Andrew M. Cuomo and the New York State Legislature. Additional support provided by Samuel I. Newhouse Foundation and the New York City Department of Cultural Affairs. Posted on February 7, 2019 . ← Spotlight Theatre Presents: Once on This Island Jr.